There’s no denying that real estate is one of the most pressing issues in Canada – it seems like a new headline drops every day, and everyone has an opinion (or prediction!). Looking to stay in the know? We’ve rounded up some of the savviest voices in the industry. They’re well worth a peek over your morning coffee, and are guaranteed to get you up to speed. Check out our top 10 Canadian real estate bloggers! Have a favourite real estate blogger you’d like to share? Add your suggestions to the comments! Are you a millennial who demands more from your money? Brush up on your investing basics – including the real estate market – with this quintessential resource, geared toward those working and living the downtown grind. Whether you’re navigating the forex, calculating condo fees, or considering picking up an investment property, you’ll find the insights you need here, supplied by a mix of personal finance experts and university student contributors. Prefer a no-nonsense approach to your real estate news? Better Dwelling serves up the latest in housing policy, news and analysis, and never shies away from the real issues affecting Canadian homebuyers – including the occasional scathing headline. And, with a focus on Vancouver and Toronto real estate markets, they have plenty to chew on, with updates daily. A site specializing in new construction listings, BuzzBuzzHome’s blog is one of the most comprehensive housing resources, with thorough news coverage, lifestyle and décor tips, as well as solid data and infographics. Check in daily for news from every major Canadian market. Learning about housing and finance issues isn’t reserved for young adults – Canadian homeowners and buyers experience challenges at every life stage, from first-time millennial buyers to downsizing boomers. The Findependence (short for Financial Independence) Hub aims to address them all, through a wide variety of content. Helmed by Jonathan Chevreau – former MoneySense Editor at Large, National Post contributor, and Findependence Day author, it’s a great resource for anyone learning more about their real estate options. While technically a column (an ongoing section of online MoneySense Magazine), this is one of the best places to get up-to-date, relevant commentary on the most pressing real estate issues facing Canadians. Seasoned senior editor (and licensed realtor) Romana King has a knack for explaining even the most complex financial issues so that they’re relatable to all home buyers, owners and sellers. A comprehensive look at markets across the country, in addition to U.S. and international news – because being in-the-know means looking beyond Canadian borders! With an extensive expert knowledge base, this is a great resource to visit to get caught up, find solid info on the basics, as well as design and tech updates. Does the world of mortgages have your head spinning? Fear not – in addition to the market’s best rates, calculators and tools, you’ll find everything you ever wanted to know about financing your home in RateHub’s blog and learning centres, plus the latest on credit cards, personal finance products and insurance. Living high in the sky is an increasingly popular lifestyle – but buying, selling, and living in a condo come with unique pros and cons. TalkCondo makes it its mission to answer every condo-related question, whether you plan to invest in a unit, or raise your family in one. Plus, get the latest on new builds popping up across Ontario. When Bosley Real Estate Realtor David Fleming entered the industry, he found available real estate news and advice blogs to be woefully one sided. He decided to challenge the status quo – and his passionate, informed (and often hilarious) blog is one of the highest read among buyers and industry insiders alike. Is Canada’s market really a bubble? Is a crash coming? What’s the deal with new mortgage rules? Fleming tackles them all. 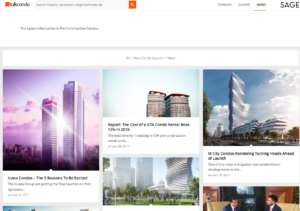 Toronto Storeys may be a relative newcomer to the housing blogosphere, but has already established itself for its extremely high-quality content and informed contributors, including agents, journalists and analysts. And, while you’ll check it out for its newsroom quality, you’ll stay for the fiery commentary, including Toronto Star journalist Chris Hume’s Hume with a View section. Want the inside scoop on new projects around Toronto? Get the latest on upcoming developments with a focus on condos, architecture, real estate and urban development, from brand-new neighbourhoods to ongoing transit projects.